I thought it was fitting considering a bunch of us were embarking on a 26.2 mile run the day after through the street of Berlin. However, if I roll the clock back, one could suggest this Marathon adventure began as the winter of 2015 was setting upon us last October. 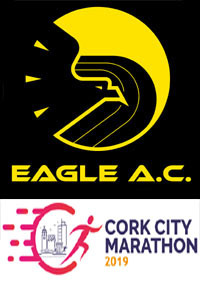 A brief chat between a few of us at the CIT track on a Tuesday night and before I knew it, myself and 5 or 6 other Eagles had logged onto the website and put our names into the Berlin Marathon ballot for 2017. Accommodation was booked just in case and then the nervous wait till November 10th kicked off i.e. the date when we would be notified whether we were in or out. The downside of all this optimism was that in more recent years, gaining entry through this process has proven to be more difficult and unfortunately that was the way it worked out with myself being the only one of us, who had planned to travel together, gaining entry. Little did I know that some of our more elite Eagle athletics had similar plans so it wouldn’t be a trip made on my own but more about that later. Following my obvious excitement of getting in, the plan then over the winter months that followed was to just keep weekly mileage at a decent but not crazy level. Come March time then, I decided to keep my long runs at the weekend at a minimum of 15 miles and mix it up with some mid-week speed sessions. It was around the June time then that my preparations for the race got a decent kick up the backside. 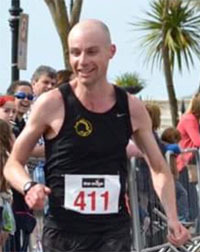 At the Cork Half-Marathon I wanted to set out a marker for myself and break the 1:30 barrier for the first time but it just didn’t happen on the day even though my time was a PB at the distance. 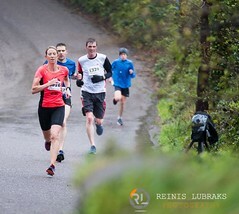 It was now time to knuckle down with it being only 14 weeks or so to race day. My marathon best was 3:15:19, so from the outset I wanted to set myself a goal of getting under 3:10. Over the subsequent weeks my weekly mileage went up to low 40s initially and then to the high 40s/low 50s. 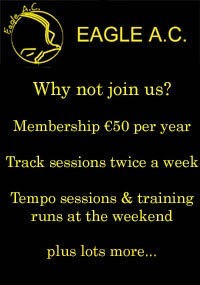 Fellow Eagle Runners Dermot Slyne and Michael Ryan joined me for many of these hard graft sessions with Michael also having entered the Berlin Race. 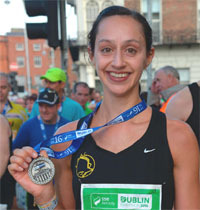 My Pre Berlin Race confidence got a major kick after achieving a 1:28:02 on a hilly Clonmel Course in mid-August and just over 2 months after my 1:30:30 in Cork. On the downside in the same week I seemed to pick up a niggle/injury in my right knee and hip area and for the remaining weeks of training and taper, this didn’t really go away even though it did get a lot better especially in the taper period. Friday 22nd September finally arrived and with my wife Michelle unable to travel over until the Saturday night, we decided that I would get the bus to Dublin on the Friday while she would bring the car to Dublin on the Saturday for our return trip. Friday itself turned out to be quite long in that I left home at 11:15 in the morning to catch the bus from Cork city to Dublin Airport. This was then followed by some wait time with the flight departure from Dublin at 6pm. It meant that I was eating lunch and dinner out of sync and I eventually only got to the hotel in Berlin that night at 11pm German Time. Probably something I would adjust if I was to do a similar trip to Berlin in the future. As I boarded the plane in Dublin, fellow Eagle Ronan Boland and myself exchanged greetings as we had never spoken before but did recognise each other. Due to the fact that Ronan knew various other racers, it made the trip to the hotel easier in the end as a number of us decided against a bus trip into Berlin from the airport at that hour of the night and instead jumped into a 6 seater taxi. Also, it just happened that Ronan and his family were staying in the same hotel as myself i.e. Titanic Gendarmenmarkt by the way and a lovely hotel near the Race Start/Finish Area. Would highly recommend it. After a good night’s sleep and some nice breakfast on the Saturday morning, Ronan had kindly invited me along to meet a number of fellow Cork Runners for a pre-race jog at 10:30am that morning. We were also joined on this by other Eagles Alan O Brien and Vivian Foley. Vivian, it has to be said, was in buoyant pre-race form, squarely off to a certain Leevale competitor insisting he would be the victor on Sunday between the two 🙂 . 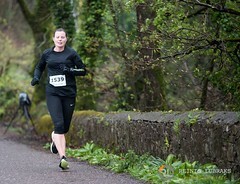 And I am delighted to say that this is the way it turned out with the margin being a mere 10-20 secs. As for myself, on arriving at our jog starting spot, it became clear quite quickly that I was going for a light run with folks that were aiming for some serious times on Sunday. In all, there was about 10 of us there and after taking a picture or two, we headed off and ran the last 5kms of the Marathon Race course. This proved to be very beneficial to myself and something I would recommend as when the body was being challenged at that stage of the race on Sunday, having an idea of what remained ahead was great. When our jog brought us to the start/finish area, other useful tips were thrown out by Ronan like the fact that all participants would be entering their starting areas from the right-hand side of the course so it would be advisable to jump the small barrier in the middle of the road to allow yourself to start on the left hand side of the road. The reason for this was that the left side by default is less congested and hence would result in a more smooth start. Pre-race talk of weather was that overnight rain would clear giving rise to a cloudy morning for the race with temperatures of 13-18 Deg so all of us were very content with that. When we all parted our ways that late morning, good luck gestures were exchanged and a number headed off to relax for the remainder of the day although the remainder of us had planned to meet again for dinner that evening. For myself I quickly made my way to the expo and got the number sorted before returning to my hotel room for a relaxing feet up afternoon. I even had a small cat nap which was great. Around 8pm then that evening my wife Michelle arrived into town and we joined the others for our fill of pasta at the Da Vinci Restaurant. After that, it was lights out in the hotel at 11pm before the big race on Sunday. Sunday morning arrived and after a quick glance out of the window, it became very evident that the rain had not cleared and instead there was a very misty feel about. Anyway, I headed off and ate some breakfast and then around 8am I headed to the start area which was only 1-2kms away. Security was very high on the streets. Police with guns were very visible at almost every corner but I suppose that is to be expected these days. Access to the start area was permitted only by race runners via a bracelet which you received when getting your number at the expo on the Saturday. This lead to small queues gathering at the entrance areas. One humorous thing I noticed there was the facility to get your race number re-printed and the amount of participants that were availing of this. Surely one can’t forget their number on the morning of a race but it must happen and seeing the relief on the faces were gas. Finding the bag drop area was challenging (another item Ronan had pointed out to us on the Saturday). Signage wasn’t great for this and not all participants went to the same areas to drop their bag. I eventually found it anyway and my final stop then was my starting pen area E.
So what was the goal for the race. I was having mixed thoughts all week about race pace but after bouncing many thoughts around in my head and given that it was a wet cloudy day and a flat enough course, I decided to not hold back and go out at 7:00ish mile pace which would probably work out at a 3:05/3:06 marathon time. The 15-20 minutes I spent in Area E prior to race start was fantastic, between the music, the vibe, clapping and big screens showing it all. It makes you realise that when 40,000 athletes descend on one place, it is such a big crowd. At 9:15 the gun went off and away we went. It was 2 mins or so before I did get to cross the start line and it was a 2 mile stretch before the first turn, a right handler and also where the 2 starting lanes merged. It proved to be enough time to get a sort of racing rhythm and from what I could see, Ronan’s advice was indeed correct and it was less congested on our side of the road. I got into a groove of 7min miles but my thoughts at the same time were one of fear i.e. was I running too quickly too soon but I was willing to go with it knowing I had done the miles in training and I had to push the boundary to get a PB at this level. Even though the rain had stopped prior to the start of the race, it soon started again which meant for very wet roads and puddles and the thought that a slippery spot could be anywhere ahead. This leads me to my one and only gripe about the Berlin Marathon i.e. The Water Stations and layout of them. Water is dished out in Plastic Cups and not bottles like you might see in Dublin for instance. Also Water is only available on one side of the road in most places. 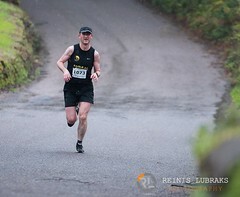 Hence getting water was somewhat hazardous in the wet conditions as racers dived across the road to grab those cups. The result of all this, especially at the pace I was running at and the volume of racers running at that pace, was a loss of race rhythm and having to regain speed coming out of the area. Lastly then since Plastic cups are light, one can’t throw then to the side of the road that easily so you could spend a few hundred meters running over masses of these things on the wet road and trying not to slip. I can only assume that between the race start waves these things were cleared from the road but we were the last Area to leave within our start wave. As the race progressed to the latter stages, these water areas got more hectic as racers got more desperate to get their water and hydration. 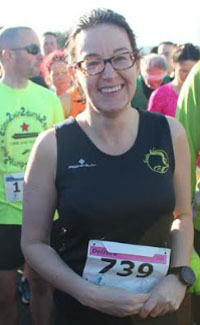 Even though I felt I was running at my limit, the first 7 or 8 miles were comfortable enough but at the same time I was trying to pick out racers who were on a similar pace to me. I thought this might come in useful in the latter part of the race. 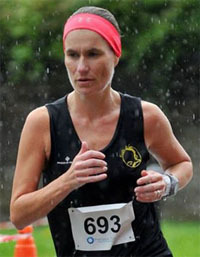 It was at that stage I happen to fall in beside a female runner from Tracton AC (Margaret Dempsey). We exchanged hellos and had a small chat regarding Cork etc etc. Our running pace was worked out to be the same and as we ducked in and out of water stations on the subsequent miles, there was a glance to see had we both got through ok. Miles 10, 11, 12 and 13 went by and as we passed halfway we were briefly joined by a third Cork Runner before we lost that guy again as he bolted on ahead of us. 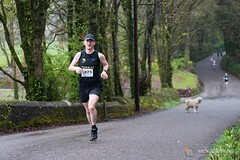 My time at halfway was encouraging, I felt ok and we were still knocking out 7 min or so miles. The next 4 miles passed by quickly before I was feeling a small bit fatigued for the first time. 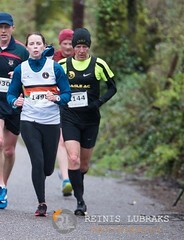 Having a local club runner running beside me definitely helped me during this period even though she didn’t know it. 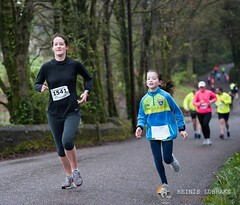 It was something for me to hang onto and Margaret was running very strong it has to be said. Anyway a gel taken here and luckily a nice downhill section followed and I was back on track. There was around 19 miles gone at this stage and I then went through a really good period and knocked out a couple of 6:58 miles then. 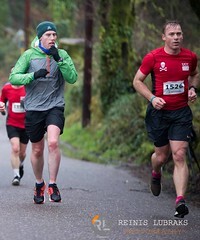 When I passed mile 21, again I still felt ok. It was around mile 22 and another water station where a racer almost wiped me out getting water. 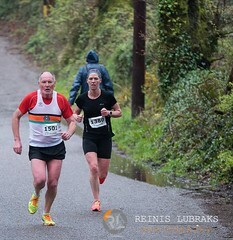 I nearly came to a stop and lost contact with my fellow runner so rather than trying to speed up to catch up I decided to put the head down to get home as I knew if I could hold it together a good PB was on the Cards. Mile 23 and 24 passed with my average probably now dropping to 7:10 to 7:15s and my stomach probably tightening up too. As I approached the last mile or so I knew that a sub 3:10 was there for the taken so I made a conscious decision to intake water at the last station by stopping to help the stomach and get me to the end. That worked out and got my pace back to 7:13 for the final push. Great crowds lined the whole route but particularly the latter stages and as I re-ran that 2 kms (from day before) and passing under the Brandenburg Gate I knew the goal was achieved and all the hard work had paid off. Coming to the finish line I knew a small sprint would get under the 3:08 so I managed to find something in the tank to do that. The usual recovery moments following the race were tough but I made my way to get my bag and return my chip timers to the required drop spot. It was at this stage I got my bag and phone back and here I spent a few minutes replying to messages and searched the tracker to see the fellow Eagle folks ran. 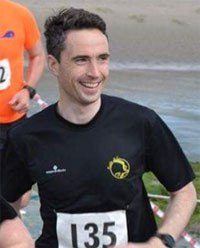 Remarkable stuff really from Alan O Brien with his sub 2:30 and also from Vivian, Frank and Ronan, Sean and Michael. Huge kudos to them all. Post Race drinks were arranged for the place called the Stand Bar so it was back to the hotel for a quick shower, change of clothes and straight out to the pub. There we met most of the Cork runners we had met on the Saturday with partners there also. Pretty much everyone too was delighted with their performances and new PBs were the theme of the day. Lots of race chat was had at the same time as we probably floored 10 or so large pizzas before we decided 2 hours later to go for another meal down the road in a nearby restaurant. Around 11pm many of us parted ways with some kicking on to the Marathon afterparty. The rest of us headed back to hotels as we had early flights on the Monday morning. Overall my Berlin Marathon experience was fantastic and a great opportunity to meet fellow runners on their own journeys to achieve their own personal goals. In a funny way, we all had a lot in common and as one guy in the group said on Sunday all marathon runners are off centre people i.e. a bit mad 🙂 . As for myself I am now coming up to 2 Yrs and 9 months with Eagle AC. During this time I have come from a starting base of 3:35+ marathons to 3:20, then 3:15 and now 3:07 in that time. 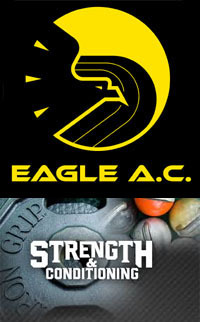 Eagle AC is a great club with people, friendliness and organisation that should not be underestimated. Members are also very willing to freely give advice and encourage others to improve. 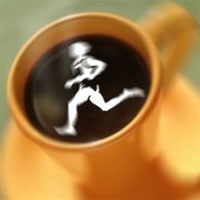 It has helped me improve as an aging athlete and achieve my own goals. 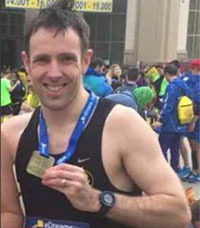 This entry was tagged 2017, Berlin Marathon, Donal Dowling, Eagle AC. Bookmark the permalink.